Cleansing, Exfoliating and Masking are the 3 pillars of my skincare. While cleansing and exfoliating take care of taking out all the dirt from the pores, masking is where we provide additional benefits be it combating blemishes, minimizing acne scars, increase brightening and so on. Nowadays, pick up any beauty magazine and there are at least 10 other steps inserted in there... double cleansing, toning, chemical peeling, oil cleansing, serum, double serum, multi -masking and what not. 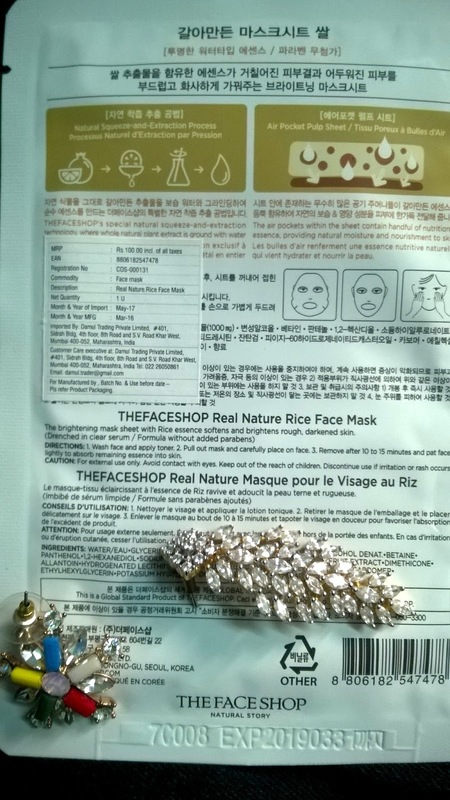 Packaging of Face Shop Real Nature Sheet Masks is very simple. Simply cut the outer packet and there is a cotton sheet soaked with serum. Each sheet mask has more than enough serum for face as well as neck. In fact, always make sure to not waste the serum and use it on neck or hands. 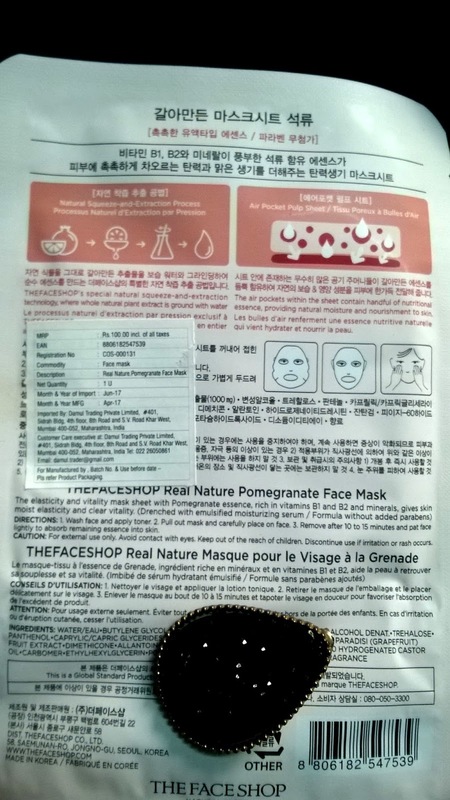 Ingredients list is a bit problematic as I thought they would simply have the concerned ingredient with a little bit of water and glycerin, but each sheet mask has a long list of alcohol as well as parabens too. 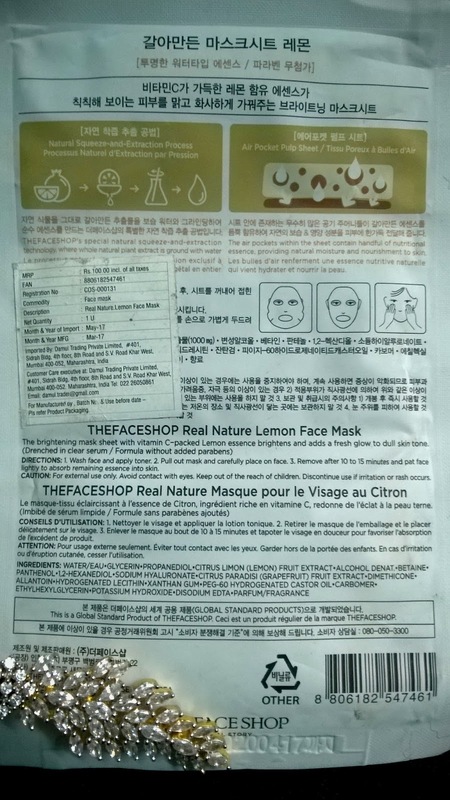 Claims of each sheet mask is related to the main ingredients. For Pomegranate, it is providing Elasticity and Vitality. Availability is not very common, I have bought it online on Amazon for Rs. 100 per mask when there was an offer going on of Buy 5 Masks, Get 5 Masks Free. Check them out, they often have such offers going on. Quantity of The Face Shop Sheet Mask is 10 grams, enough to last 1 usage over face as well as neck. Usage - Every Face Shop Sheet Mask feels cool on skin. Simply take out the sheet, arrange it all over the face, the serum is neither very thick nor too runny. Lie down somewhere for 20-25 minutes while the serum goes to work on the face. At the end, when the sheet feels just about 15-20% wet, take it off. Massage the extra serum still remaining in the sheet on neck or hands. Some people like to wash their face after some time but honestly I have never felt the need. Just massage the serum in, wait for some time and go to sleep. I always do this at the end of the day so the serum has time overnight to work on my skin. Effect - Honestly, do NOT expect miracles. I bought 2 sheets of each type each (2 lemon, 2 rice, 2 acai berry, 2 pomegranate and then extra 2 lemon to take advantage of Buy 5, Get 5 Free offer). I used them once per week and saw the results over past month. They did what they promised. Lemon provided nice brightening effect. It also soothed my little pimples and make face shine for 2 days. Rice gave nice glow that lasted for one full day, it actually gave a facial-kind of glow. I also feel it would be better on someone with drier skin, not oilier. It moisturizes really well. 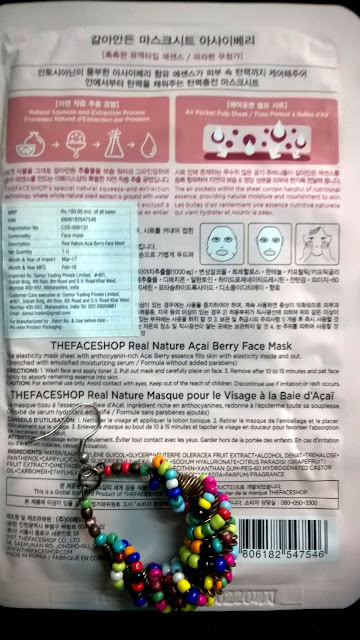 Acai Berry gave a firming and plumping effect and I used only one sheet of this, the other one I gave to mom who liked it a lot. It does amazing work on mature skin by immediately making it glow. Pomegranate was actually very similar to Acai Berry and my mom liked this one too. It also made the fine lines near my mom's eyes very faint for 2 days, gave a nice glow and youthful appearance which makes it the best face mask to use before going to any special event! One thing that might bother many people is the fit of the mask. Everybody's face is different and these masks are designed in a standard way, so on some faces it would probably droop to the chin while on others it will probably cover eyes. I have a big face so it wasn't much problematic for me, my mom has a smaller rounder face so she had trouble adjusting it especially on her cheeks and chin area. Apart from that, no complaints. I am glad that I tried them out. Recommended -YES. 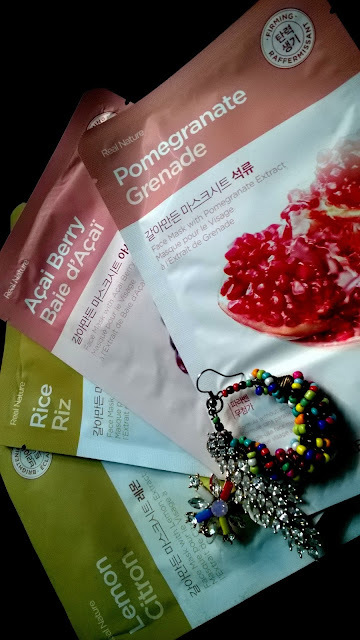 I think everyone should try these masks atleast once, especially lemon, acai berry and pomegranate. :) Rating is 4/5. 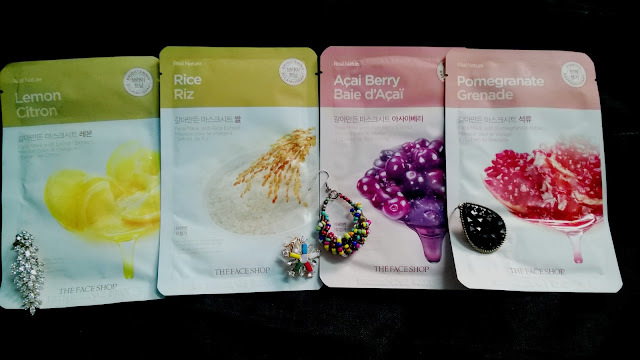 Even I get annoyed when the sheet masks turn out in different sizes every single time! !